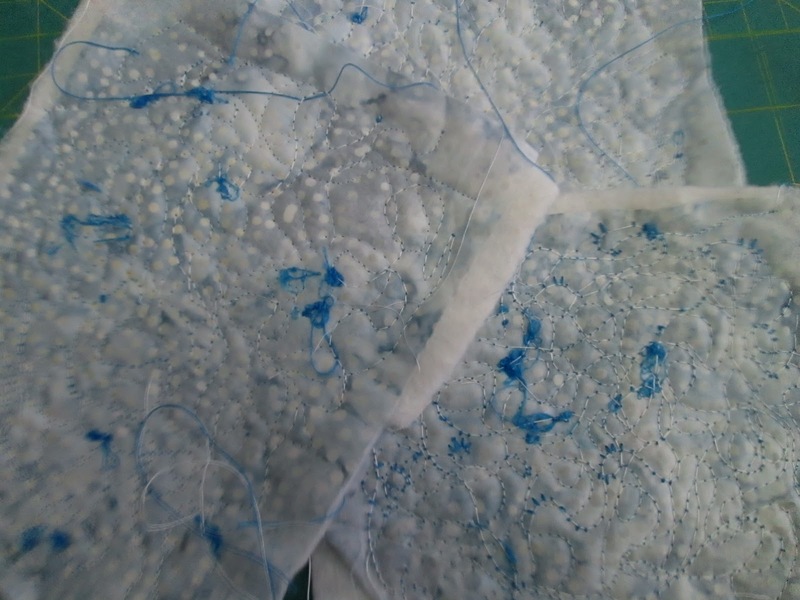 Margaret Blank: Thoughts from a Textile Artist: Breather! 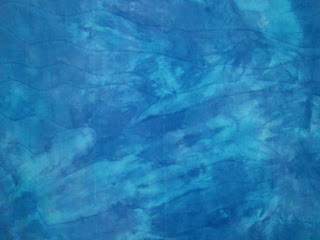 I resumed work on "Sometimes..." this morning, and when I looked up it was 12:30 p.m. I ate something and went back to work. When I looked up again, it was after 3 p.m.! 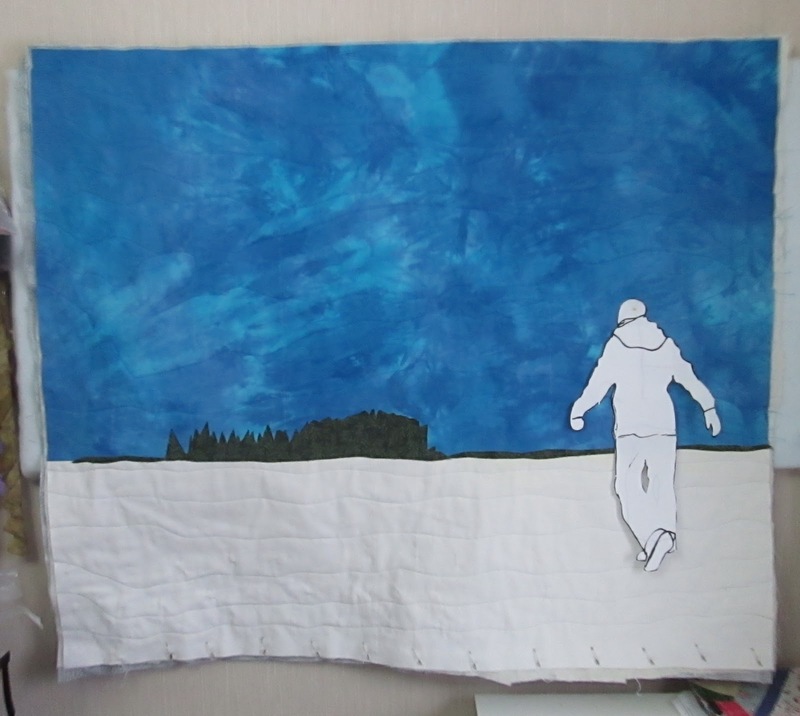 The first few hours were spent attaching the 'snow' to the 'sky' -- for real! 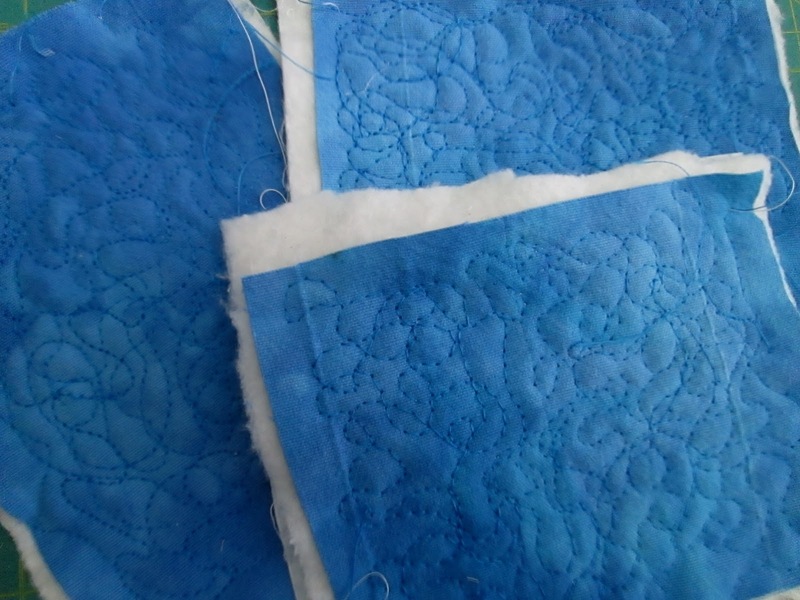 -- and preparing the entire thing for quilting. I decided to pin it as I was concerned that spray baste (my basting "process" of choice) would be a challenge with this heavy fabric. 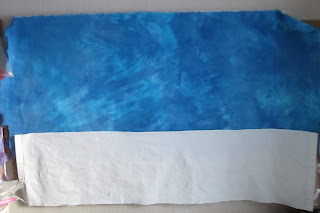 I chose a batik for the backing -- largely because it was one I'd bought to emulate "snow" and never used. It occurred to me too, though, that the dense weave of a batik could support the heavy cotton of the top better than an 'ordinary' cotton. Then came testing re: the quilting. I wanted to do free-motion, especially for the sky. I tried it out for a couple of hours...with no luck whatsoever. 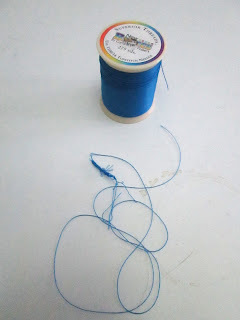 Well...the colour of thread I had on hand was found on a spool of Superior's "New Brytes" (a line designed in association with Caryl Bryer Fallert Gentry) that I'd received as part of one of the company's "Try Me" specials. It's a 30-weight polyester. 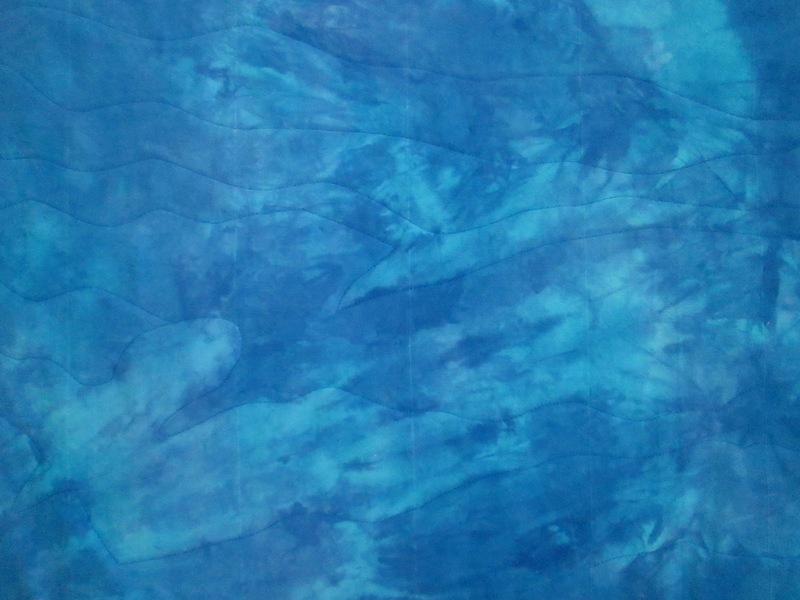 I wanted to do free-motion in the sky, a bit more densely than I usually do, following some of the dye patterns. I put in the recommended needle (100/16). I cleaned the bobbin case and filled a bobbin with white "Bottom Line" (also from Superior Thread). I put in another new needle, thinking there might have been a 'burr' in the first one. No difference. I tried lowering bottom tension. Nope. Raising bottom tension. Nope. Lowering top tension. Nope. Feed dogs up? Nope. Feed dogs down? Nope. And did I mention that even though the machine 'sounded' fine for the first wee bit while doing this, there would come the moment when it seemed to "choke"? Then I created the shoreline...the distance and the "island". I fused it in place and decided -- ENOUGH! for today. Tomorrow...Sabbath...calls for rest. Worship. Peace. Quiet. 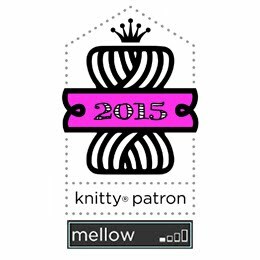 Knitting. Hand stitch. 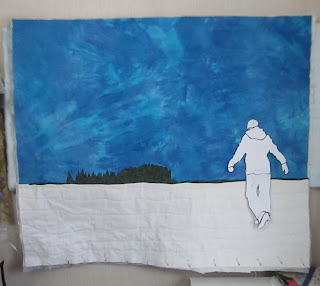 The thread-painting of the trees/shore and the figure will have to wait till Monday. Sorry you're experiencing FM quilting problems. 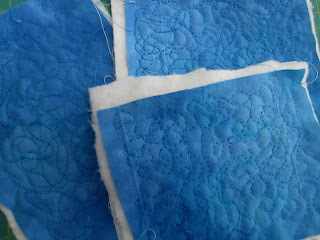 It's so frustrating, I have 3 different machines and all have their quirks but all work great for free motion quilting. Hopefully you'll figure it out! So sorry, Margaret. Machines can definitely be finicky. I just took one of mine in for service since it didn't like doing a simple straight edge line with a spun silk broadcloth and a 100% cotton that I am sure it used to sew up fine. Hope your work on Monday goes more smoothly. oh, boy! That's no fun. For sure you need a breather! So sorry for your frustration. Maybe it needed a rest? The lines your quilted are effective so perhaps that was what was meant to be? Yes, snow is not white. Saw some last weekend but its long gone. I had to raise the upper tension on my machine for FMQ - and I had to raise it nearly all the way. I've never had to do that before.... but it worked. I've run into similar issues with one of my machines. It can be so frustrating, especially when you're in the zone to get some FMQ done. The piece is coming along beautifully.